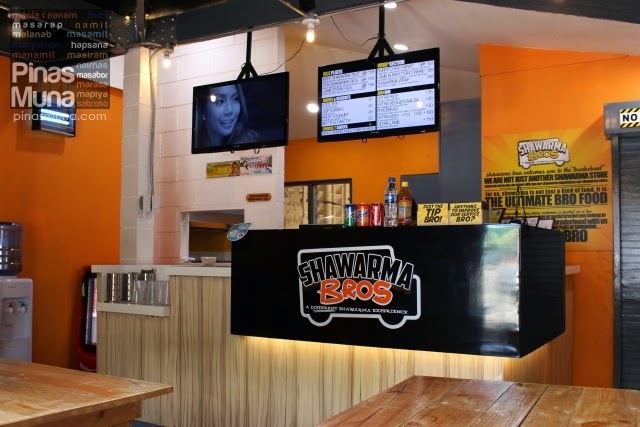 Shawarma Bros is more popularly known as a food truck, but if you are a resident of Pasig City, specifically along C. Raymundo Avenue, you would have probably seen their small concept restaurant across South Star Drug and Puregold Supermarket. 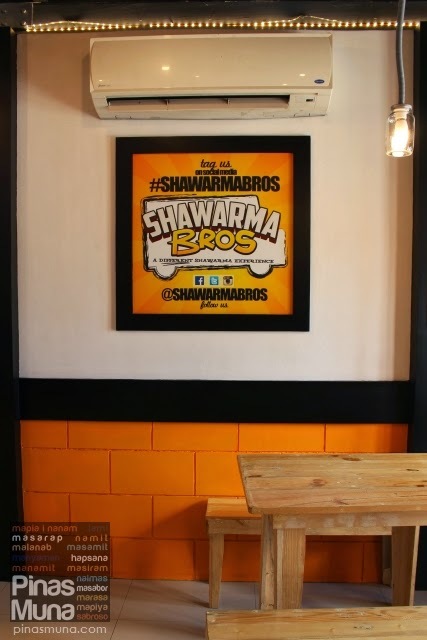 Shawarma Bros started its operations as a food truck back in 2012 and since then, they have been present in every food truck event within and outside Metro Manila. 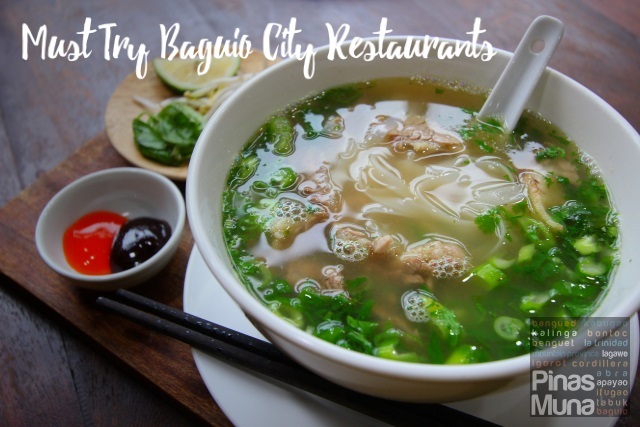 A little over a year after they started, they finally opened a concept restaurant in Pasig City last January 2014. At present, Shawarma Bros operates both as a food tuck and as a restaurant. We first sampled their Beef Shawarma Wrap (P149.00). We immediately noticed that the beef was not greasy. The beef was tender to the bite and not fatty. We also loved its flavor. The spices used are very well balanced, very light and not overpowering unlike the traditional middle-eastern variety. The pita bread had the perfect consistency and is tender to the bite. The vegetables add juiciness and a refreshing taste to the shawarma wrap. It is served with your choice of two sauces. We recommend the garlic yughurt, (they culture their own yughurt) and if you like your shawarma spicy, then you will definitely love the spicy tomato. 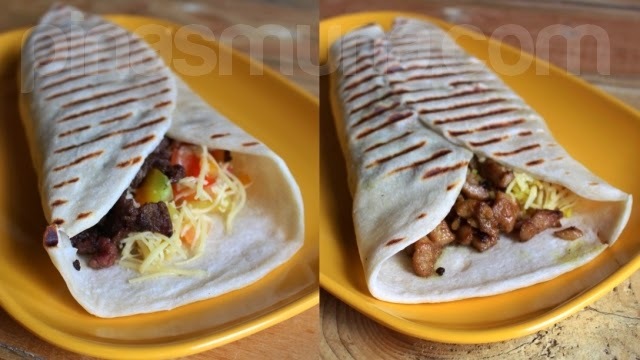 The Shawarma Wrap is also available with chicken (P149.00). We then sampled the Chicken Burrito Bro Wrap (P159.00). The Burrito Bro Wrap is basically a Shawarma Wrap with biryani rice. The chicken was surprisingly not dry. Like the beef, the chicken meat is also lightly spiced. The biryani rice makes the overall taste of the burrito wrap lighter compared to the shawarma wrap. Edgar suggest to pair this with the cheese sauce. Again, if you like spicy food, then pair it as well with the spicy tomato. 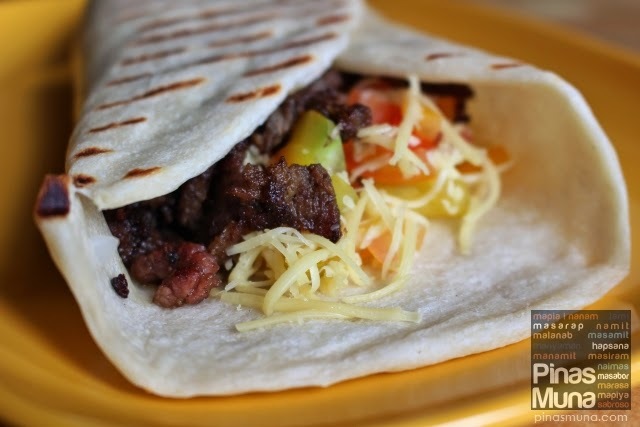 The Burrito Bro Wrap is also available with beef (P159.00) and with lamb steak cuts (P199.00). 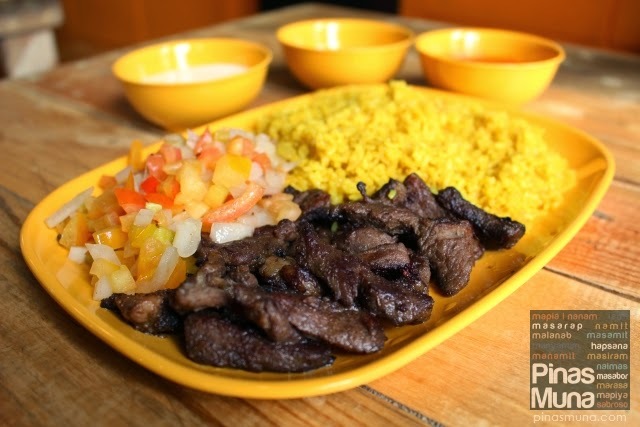 Finally, we feasted on Shawarma Bros' specialty dish, the Lamb Steak Rice Plate. 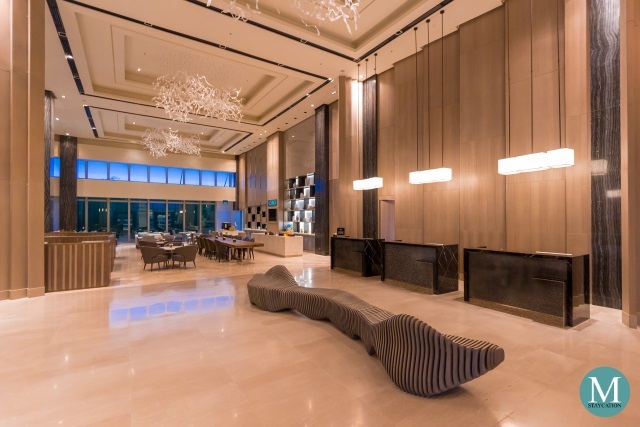 It has a generous serving of lamb steak cuts that are perfectly spiced, eliminating the pungent smell and taste of the lamb. It is also perfectly cooked keeping the meat tender and juicy. We noticed that even if it gets cold, the lamb meat does not become masebo. It is served with Shawarma Bros' own version of biryani rice and salsa with mangoes. This meal is served with your choice of two sauces. I prefer it with garlic yoghurt sauce, while Edgar prefers it with the cheese sauce. There's also spicy tomato if you prefer it spicy. And if you are a real bro like us, you will definitely order an extra serving of biryani rice (P35.00). 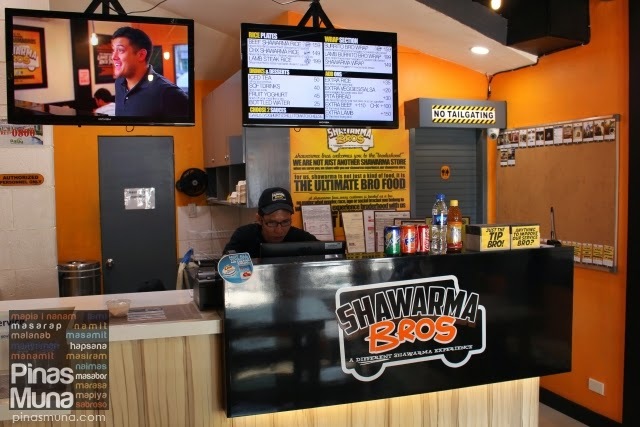 We are happy to have Shawarma Bros in our neighborhood in Pasig. 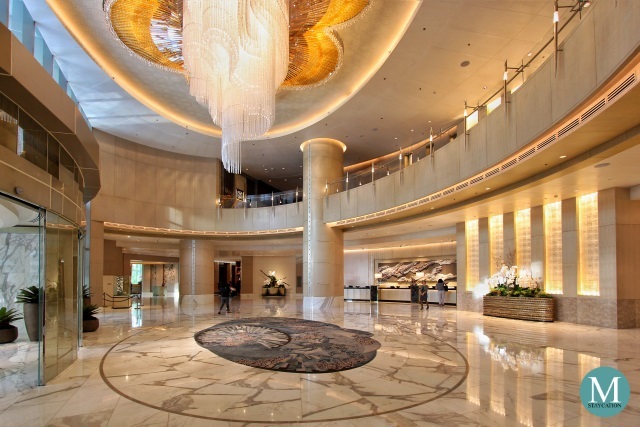 It has become a favorite to-go place of ours for lunch. 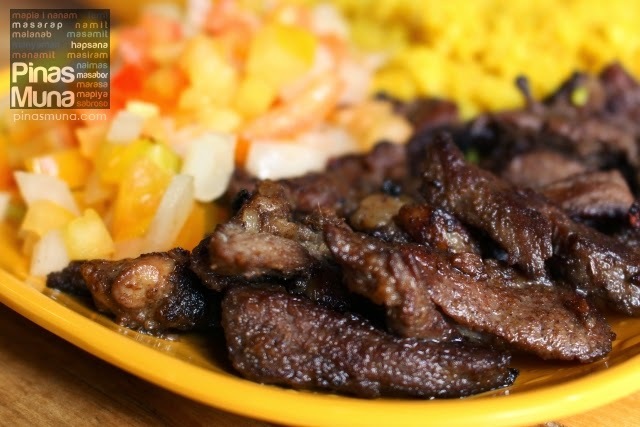 We have to admit, we got addicted to their Lamb Steak Rice Plate. Kakaiba talaga! 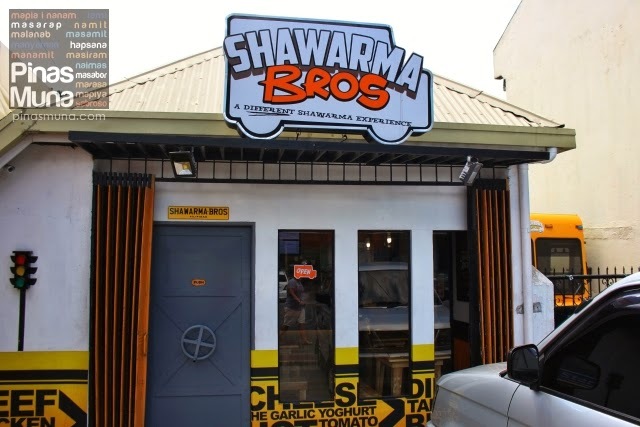 Thank you Shawarma Bros for opening your concept store here in Pasig. Thank you for bringing your unique shawarma experience to the Pasiguenos and we wish you more success and growth so that you can open more concept stores around Metro Manila. If you are driving, there are three routes coming from C5: (Route 1: blue line on map) via Ortigas Avenue Extension, cross Rosario Bridge and turn right on C. Raymundo Avenue; (Route 2: red line on the map) via Shaw Blvd-Pasig Blvd Extension, cross Vargas Bridge, turn Right at Pasig Rotonda (landmark is Jolibee) then turn left on C. Raymundo Avenue; (Route 3: green line on map) via Eagle Avenue, cross Sandoval Bridge, turn right on Dr. Sixto Antonio Avenue, then turn left on Stella Maris Avenue, then turn left on C. Raymundo Avenue. 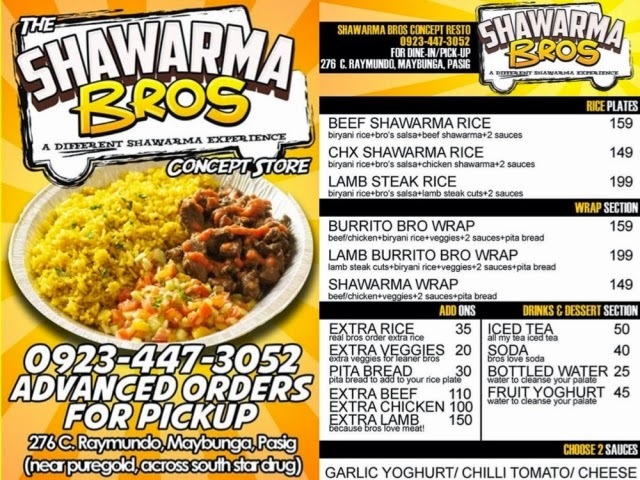 Shawarma Bros Concept Resto is located near Puregold Supermarket and right across South Star Drug. There's limited space for parking in front of the resto. Alternative parking space is at Puregold Supermarket. 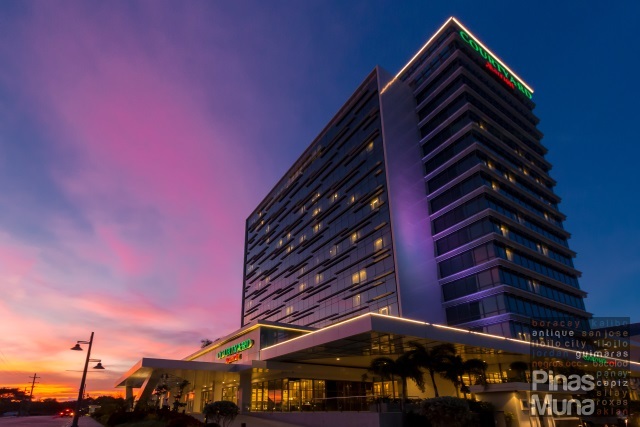 By public transportation, from EDSA-Shaw take a jeepney or FX bound to Pasig, get-off at Pasig Rotonda then take a jeepney bound to Marikina in front of 7-11. Get-off at Stella Maris and take tricycle to South Star Drug. Alternatively, from EDSA-Ortigas, you can take a jeepney or bus bound to Cainta, Angono, Taytay, Antipolo or Binangonan. Get -off at Rosario then take a jeepney with the signage Pasig-Tramo. Tell the driver to drop you off at Puregold.